Satellite broadband is available for those who don’t have other options for broadband services and NotSpot can assist you to establish if this is the right solution for you. Here in the UK the main advantage of satellite broadband is that it works everywhere as long as you have a clear line of sight to the south. 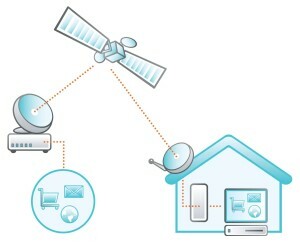 A Satellite broadband connection is created by simply mounting a specific type of dish to your premises that provides a two-way access to our broadband services. Satellite broadband provides speeds of up to 22 Mbps download and 6 Mbps upload and can be seen seen as a guaranteed option for broadband provision in hard to reach areas that are unlikely to receive next-generation fibre or other technologies. limit the use of many real-time applications e.g First person shooter games you will lose, but video conferencing and VoIP will work so long as you allow for the extra lag.If you are considering remote access to your office/work via Satellite broadband, we have the ability to establish if your chosen VPN/service will cause you any problems. With 6Mbps upload and a fixed IP this product is designed for businesses that have remote sites that need a fast and robust connection to back up files or remote monitoring.